I love historical fiction novels that offer a look into a time that isn't emphasized much. 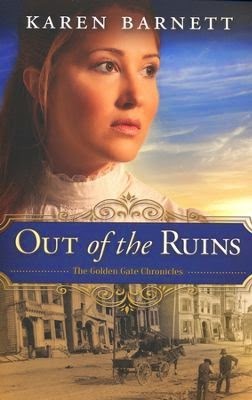 Out of the Ruins offered a wonderful glimpse into the beginning of the 20th century in San Fransisco where the world is starting to morph into the modern era that it is today. Out of the Ruins seemed like it was two books in one. Part one focuses on the new medical technology of the time. Dr. Robert King and his mentor Dr. Gerald Larkspur have been working with radiation from the newly discovered X-ray technology to help battle cancers. It was interesting to see how this started the path to cancer treatments today, but reading how the radiation scales were tested on the doctor's themselves made me cringe. We know so much more about radiation now, but back then it was so new and unknown. It was in this first part of the book we really get to know Abby. She is battling so much. She has a very weak faith and then she is handed her sisters diagnosis of leukemia, and she is forced to relocate so her sister can get the treatment she needs. As time goes on, she loses the only home she ever knew due to the medical bills her family has received. And finally, after much heartache and change, the great quake strikes the city and a massive fire sweeps through. She is lost. The second part of the story is a story of survival and finding faith through the darkest of times. We see in this part of the story the quake and how quickly the fire decimates the city that has lost it's water supply. It a horrifying time for everyone there. I did kind of wish that the quake was shown in a little greater scale here, but the destruction that it produced started to unfurl as Abby made her way through the city. I enjoyed how this story wasn't strictly a love story between Abby and Robert, I enjoyed that this is a story of finding faith. Everyone, I believe, has been in a place similar to Abby. The feeling of being alone, with no one who cares to watch out for you as you are thrown one hard ball after another. However, when offered a life raft for her pain through a journal from her aunt, she takes it and Abby starts to learn and grow. I enjoyed the the background history and the main story of this book. I'm looking forward to the rest of The Golden Gate Chronicles. 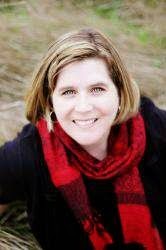 Karen is celebrating with a fun giveaway and Facebook author chat party. Thank you to Litfuse Publicity and Abingdon Press, I received a copy of this book for free in exchange for an honest review. I really want to read this one! !